Attention ukulele players and enthusiasts! We're doing it again! Join us at the second Connecticut Ukulele Invitational! 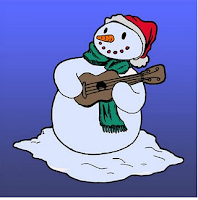 Can the holidays be complete without ukuleles? NEVER! Join the fun: Featured performances by Roswell and the Ukulaliens, plus Uncle Zac, No Soap Radio, Michel Driscoll, Ted Jeffries, Chris Young, Cecilie Rindom, Chris and the Kookie Ukies -- maybe even the Fleas! Be sure to bring your ukulele for the play-alongs! There will even be an open mic, time permitting. Fleas infest The Music Room! 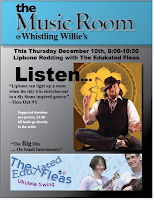 The Fleas are delighted to be part of the new Music Room at Whistling Willie's. We'll be playing a 40-minute set at 8 pm, so drop in for a drink, an appetizer or dinner and enjoy a few tunes!